In 2009, I was invited by OWW consulting, a leading CSR consulting firm in Malaysia, to speak at their CSR conference in Kuala Lumpur. It was a very impressive conference with many experts presenting their views. And listening to them all I could think of was the fact that I had so much more to learn. Incidentally, I was the only speaker from the world of public relations or what they called reputation management – the link between CSR and Corporate Reputation. I took my cue from this brief and made a case which could have got me into a lot of trouble with my hosts! I made a case that CSR as we know it is dead or dying and a new avatar is emerging. My hosts were generous and kind and here I am sharing with you the contents of my argument. Hope you enjoy it and share your views after thinking it over. For far too long, Corporate Social Responsibility(CSR) has stood for nice-to-have initiatives that round off a hard-nosed successful business with the softer dimension of social good. Doing good for the community! Philip Kotler, Professor of International Marketing, Kellogg School of Management in his book on CSR, defined Corporate Social Responsibility as “a commitment to improve community well-being through discretionary business practices and contribution of corporate resources.” This is one place where I disagree with my ‘guru’ of marketing, someone whose teaching I have followed since the inception of my marketing and communication career. Times are changing. 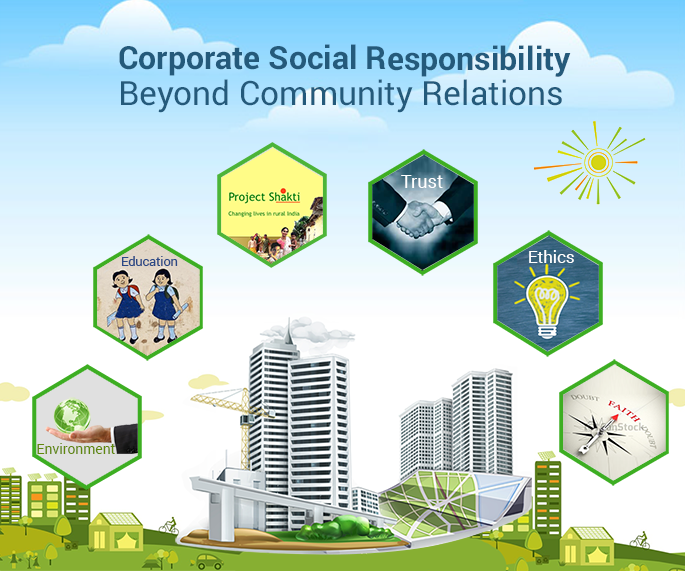 CSR is moving from this optional corner to the mainstream as ‘business responsibility’. Today, there is no difference between ‘doing well’ and ‘doing good’. As we knew it, the former referred to the nuts and bolts of business strategy and the latter referred to CSR. The two are now merging. We are entering the dawn of ‘Business Karma’ where Corporate Social Responsibility(CSR) has to transform into Responsible Business Strategy (RBS) Why? Because, Karma is the cosmic law of action and reaction. Under its control we souls in the material world reap good or bad results according to each act we perform. Today, the economic and legal responsibilities of an organization share equal space with ethical and social responsibilities. Businesses! For far too long they have only worked towards the vested interest of their shareholders alone! This transformation is happening not because Bhagvat Gita has been read by the business leaders! On the contrary, it is a result of several underlying events that have taken place over the years. Karma has been at the heart of this transformation. The very first change that took place is defined by Jack Trout as ‘The Tyranny of choice.’ There has been an explosion of brands around us. If we were to go shopping for a pair of running shoes in the US of the 1970’s, we would perhaps be faced with a choice of around 5 brands. By the 1990’s this number had exploded to 285 brands. Were we buying a PC on the other hand, we would be compelled to choose out of over 400 models and if all this gave us a headache, we would need to make a selection among 171 brands for an over the counter painkiller! The consumer psyche hates confusion. Minds can’t cope with this, they lose focus and companies as a result are faced with the Tyranny of Choice –stand apart or stand down. Differentiate or Die! Second, came what I call the CSI effect (it’s not the popular TV serial), it stands for “Corporate Social Irresponsibility”. Beginning with Enron in the early 2000’s, as you would recollect, skeletons just kept tumbling out of corporate closets taking in their fold some of the most respected names in business… Arthur Andersen, Xerox, WorldCom, Merrill Lynch, Tyco, Citigroup, Freddie Mac…the list went on. And if that wasn’t enough, the final axe came down with the sub-prime crisis in 2008 and we are still reeling under its impact. Third came, climate change! Companies are seen as gross violators of the environment and today people care more than ever before. More than a billion people participate in Earth Hour every year. They care about the future of their children. According to a McKinsey & Co. survey of over 4,000 consumers worldwide, transparency about business practices and risks of products and services are very important considerations for them when they make their choices – and they don’t seem to think that companies are not giving these issues adequate importance. Together, the interplay of these factors has led to the emergence of a “Trust Deficit”. Over 75 per cent of people have less trust today than last year in the senior management of US companies as per a Harvard Business Review survey. Even among non-US companies more than half of those surveyed felt their trust had eroded. Now consider the fact that consumers are willing to pay more for products of what they consider socially responsible business. What is more, employees too are willing to work for less salary at socially responsible companies. Consumers are no longer willing to ignore irresponsible action; they will punish companies they consider irresponsible. Around half the respondents to the McKinsey survey in the US, UK, Germany and India and as many as 79 per cent in China said they have refused to buy products and services from companies that they considered to be against the best interest of society. What am I saying then? Doing good is good for business! Do the math. CSR has to morph into RBS Responsible Business Strategy. What does this transformation entail? Businesses have to stop seeing CSR as mere Community Relations and discretionary, instead “embed” Corporate Governance, Sustainability, Environment and Community Relations into its core business strategy. By embedding responsibility into business strategy, business today has the unparalleled opportunity to become a force of good. And in an increasingly level playing field, this can pose as an active differentiator and make powerful business sense. There are green shoots of this thinking that is taking place and one has to look at Grameen Bank, HUL’s Project Shakti, GE’s Ecomagination, Infosys’s governance model, amongst several others and learn that doing good is good for business! The late Anita Roddick was a pioneer and an innovator and look what it did to the Body Shop brand. Need I say more?